Parties big and small are one of life’s greatest joys. There is nothing like connecting with family members, friends, coworkers, and others in your community. While the party itself will probably be a source of great revelry, the preparations for any gathering can be extremely time-consuming, frustrating, and expensive. In addition to securing a venue and sending out invites, one of the most pressing concerns of planning any party is securing food. Not only do you have to decide on what you are going to serve, you have to make sure that it arrives at the party on time and that there are plates and utensils for everyone to use. Then you need to start contacting catering companies for quotes and to make sure that they will be able to work your event. At least, that’s how party planning used to work. Would you believe us if we told you there was a way to order food that you know you and your guests will love and that you could have it delivered to the party on your schedule along with serving trays, utensils, and disposable plates? How would you feel if we told you that we could pull together a miracle of catering for your party with just one day of notice? If all this sounds too good to be true, you would be wrong. Restaurant Connection is here to provide you with all of that and more! We offer the fastest, most reliable catering and food delivery service in the Oakland County area. If you’re having a party in Troy, Auburn Hills, Warren, and the surrounding areas, we can make sure that you have the food you want, when you want it. Read on for more information or check out the site today and start planning your party menu with choices from the best restaurants in the area! Concentrate on making your party more fun for yourself and your guests by planning a meal that you know is going to make everyone smile. Once you have the food covered, you can think about other aspects of the party that might have been put on the back burner. Or, with one of the most difficult aspects of party planning taken care of, you might just want to take a break! While there are plenty of great catering companies who prepare and serve wonderful food, there are a lot of caterers who just aren’t up to the task. If you don’t want to run the risk of mediocre food, or you don’t have the time to thoroughly try out several catering companies, Restaurant Connection offers the best possible solution — ordering food from the restaurants that you already know and trust! 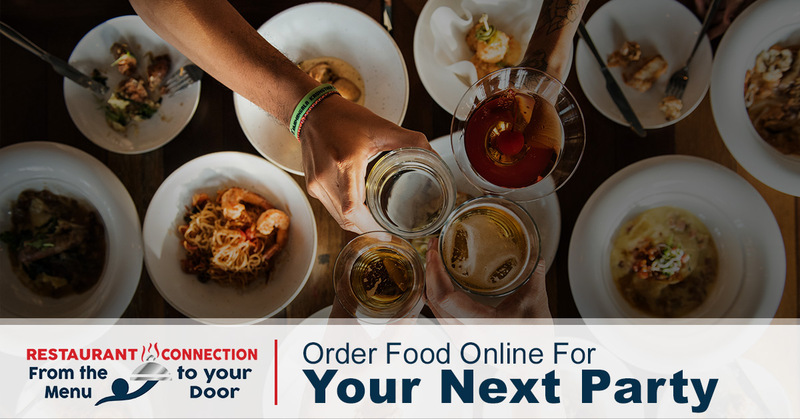 Place an order for your favorite food to be delivered to your next party with Restaurant Connection! In addition to providing the best catering options, we can also deliver food for just a few people. Find and place an order at any of your favorite restaurants in Warren, Auburn Hills, and Troy.